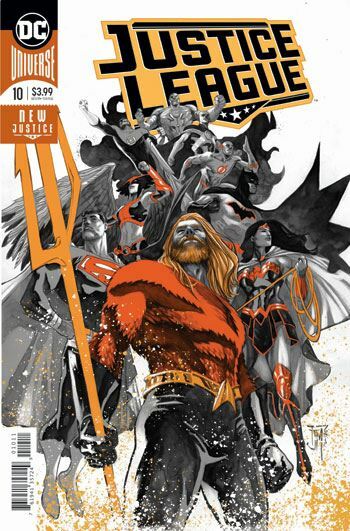 Although not cover billed as such, Justice League 10 is a prelude to the Drowned Earth storyline that commences in this week’s issue of Aquaman. Not surprisingly, this means Aquaman gets to play a central role in this issue of Justice League. But there are a couple of cameos in the story as well, as Firestorm and Adam Strange play small parts. Starman and the Legion of Doom get their plot threads put on hold, for the most part, as Aquaman, Wonder Woman and Firestorm head to the Graveyard of the Gods. There is a bit of discussion about Arion, the long ago mage of Atlantis, and some intruders he fought off, with the aid of some gods. Or so the story goes. Lovely art really helps carry this story along, as it builds to a twist that is, frankly, not too hard to guess. The fact that this leads into Drowned Earth pretty much means there is only one way the story can go, after all. But at least it’s an entertaining ride, with a lot of great visuals. 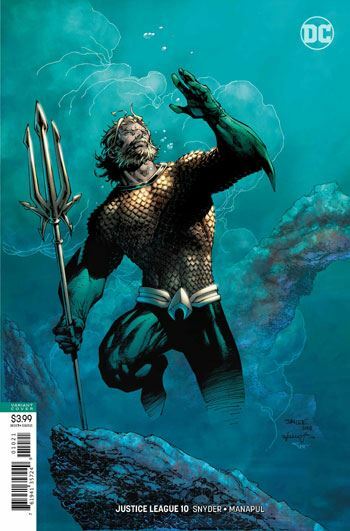 To be honest, I would have preferred to have had this issue build on what had come before in this series, but I recognize the desire for a crossover and a big Aquaman story, with the film coming out soon. And at least it only resulted in the other story arcs being paused, not getting resolved too quickly for their own good. A good issue, but more of an Aquaman lead-in than a Justice League adventure.